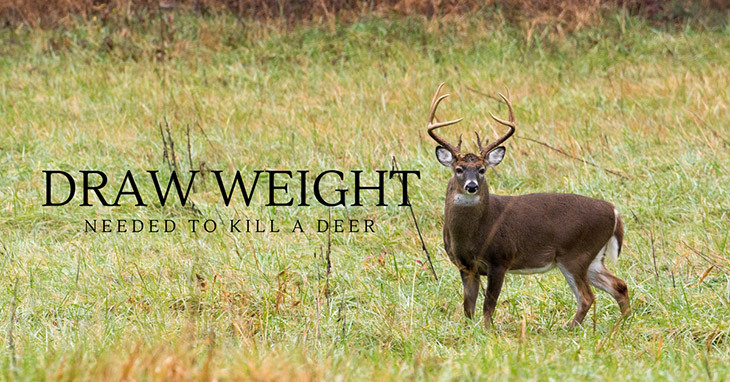 →How Much Draw Weight Is Needed To Kill A Deer? As someone who loves hunting, I had a pretty difficult time learning the skills at first, such as how much draw weight is needed to kill a deer? But through time, I started to learn about the basics and became better at killing my game. I put this article up to help beginners become more knowledgeable on the basics of drawing weight and how to use it to hunt effectively, most especially with popular game such as deer. Draw weight is the amount of weight a hunter puts into when aiming for their game. The amount of weight you put is important, as that will give your arrow the amount of strength and speed it needs to kill your target. The draw weight you'll need to become a good hunter will depend on your skill and size, as well as the type of bow you use. When you put weight onto your aim, take note that the weight will change as you shoot. 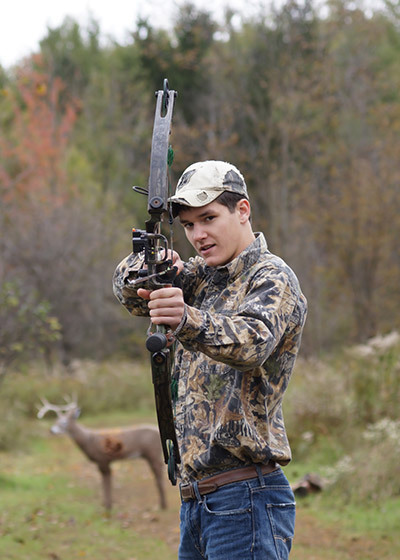 For the traditional bow, its weight will increase as it goes farther, while a compound bow will do the opposite, with only 20-30% of the weight exerted lasting once it hits your target. 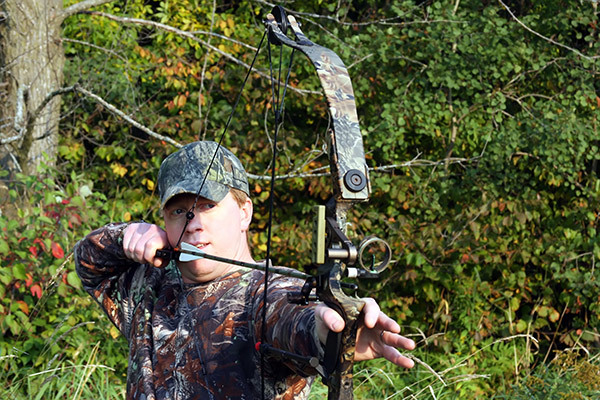 But compound bows are recommended for beginners as the weight is adjustable. Like mentioned, the recommended draw weight depends on your age and size. For small children who weigh less than 70 pounds, the draw weight would be about 10-15 pounds, increasing the bigger and older he/she gets. If you are a woman or young man, then the average draw weight to exert would be about 30-40 pounds. For most men, the average draw weight would be 50-60 pounds, depending on the weight and size of game they are aiming for. This is based on research from Ye Olde Archery Shoppe. 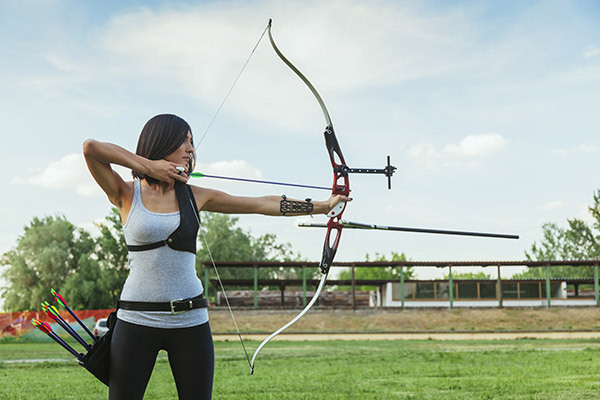 There is a recommended draw weight because you wouldn't want to strain your arms and shoulders putting too much resistance into your bow and arrow. That way, you'll get a perfect shot and be able to properly shoot without injury. For beginners, you may not exert too much weight at first. But once you practice and improve your strength, you will be able to slowly increase your draw weight by 10 pounds every few weeks. When hunting for deer, the average draw weight needed would be about 45 pounds, usually about 40 pounds or more in order to kill one. This is best in order to not only kill your game, but to also not put too much resistance on yourself, especially if you are just beginning. This is why it's recommended to practice shooting at a 25 pound draw weight before trying to aim or kill deer or other game. Take note that there are hunting laws in some states that have a maximum amount of draw weight, usually around 35-45 pounds, depending on where you hunt. It's best to do your research before hunting in certain areas to avoid breaking the law. This is based on Gear Head Archery's research on hunting laws and regulations. When it comes to drawing weight, it will take practice. This goes especially for beginners. There will be a day when you find a certain draw weight difficult to shoot, but as the days pass and the more you practice, it will soon become easier and you'll be able to draw more weight than you normally do. It all depends on how much you practice and the amount of strength you are able to exert. It's recommended to practice at least a few times a week, usually starting off with small targets until you are able to draw enough weight to kill popular game. Create a goal where you increase your weights by about 10 pounds per few weeks, until you are able to exert enough draw weight without putting injury onto yourself. Not only will you be able to kill game, but you will also have better strength and a leaner look, another reason why people opt to go hunting! For those who are keen on hunting and want to kill popular game such as deer, you must be familiar with the amount of draw weight you need to exert. At average, the recommended draw weight would be around 40-45 pounds. If you want to increase your draw weight, then you will be able to do so with regular practice and routines you are able to find online or through recommendation from other skilled hunters. 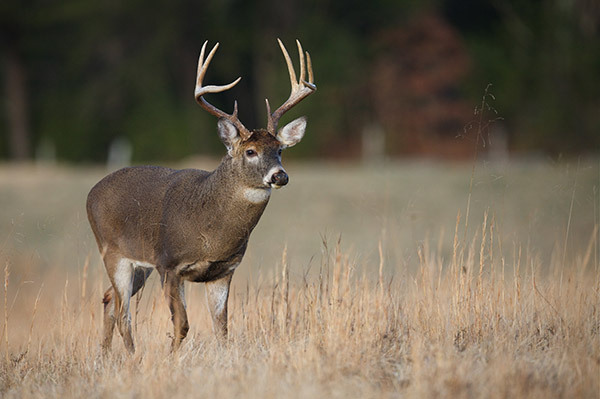 Hopefully, this article will have helped you be knowledgeable on draw weight and how much is needed in order to kill deer. Any suggestions or questions? Comment down below!